Here's another stone that I've had hanging around for a long time, not because I don't like it, but because it's so...busy! I finally decided enough is enough. Time to tackle the leopard skin jasper cabochon. 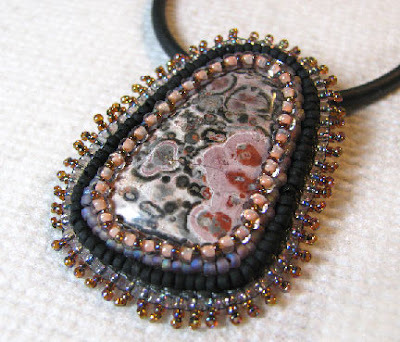 Since you are unlikely to be able to find a stone exactly like this one, I've included some currently available suggestions at this post: Bead embroidered pendant update. The simplest plan was to choose colors that come directly from the stone, and not too many at that. I chose four, but added a second finish to one of them (matte and rainbow). Even that seemed like a lot, but I believe that the stone can handle them all. This is an extremely straightforward stitching project, so I will only be outlining it here. If you need some instructions for back stitch, edging brick stitch, stack stitch, and/or would like additional information on choosing fabrics, threads, etc, please download a free copy of the first chapter of my e-book, Every Bead Has a Story. Chapter two has instructions for stitching a peyote stitch bezel, and Chapter three teaches the square stitch bail. 1. I used some double-sided tape (or you can use glue) to lightly adhere my cabochon to a piece of foundation fabric. 2. Add a back stitched row of size 11/0 seed beads around the base of the stone, making sure you end with an even number. 3. Working off the back stitched row, add rows of peyote stitch with 11s until you reach the very top of the stone. At that point, switch to a smaller size of beads (size 15/0 is what I use), and add one or two rows to cinch in the top over the edge of the stone. With a stone as flat in profile as this one, it only took one row of 11s and one row of 15s. This is unusual! 4. Add more rows of back stitched beads outside the foundation row of size 11/0 beads. I only added one row for this piece. Then cut away the foundation fabric to within 1/8 inch of the outer row, being careful not to clip any threads. 5. Lightly tape or glue the top to a piece of backing fabric in order to cover all the stitching. Apply edging brick stitch through the two pieces of fabric all the way around, and then add short stacks of smaller (size 15/0) seed beads to each edging bead. 6. Add a square stitch bail to the back of your pendant. I usually add 11 rows of size 11/0 seed beads. Copyright 2016 Cyndi Lavin. All rights reserved. Not to be reprinted, resold, or redistributed for profit. May be printed out for personal use or distributed electronically provided that entire file, including this notice, remains intact. Your symmetrical bead embroidered frame brings order to the visual chaos of the stone. It's lovely, Cyndi.